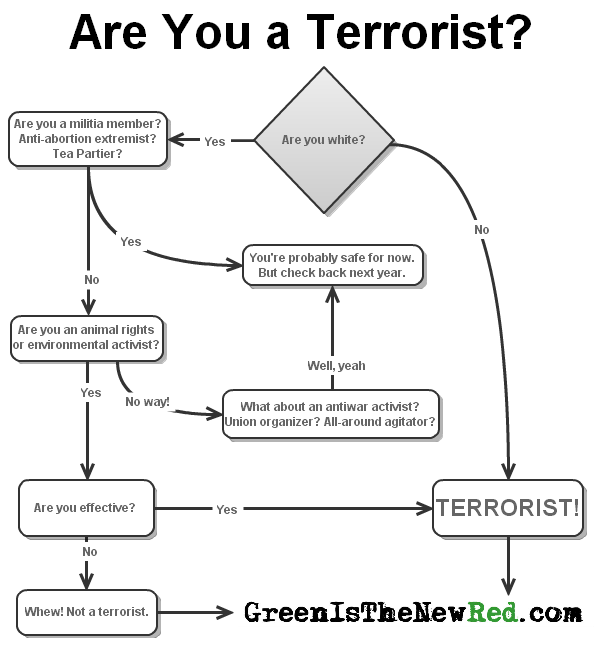 Flowchart: “Are You a Terrorist”? “Am I on a terrorist watchlist? Will I be labeled a terrorist?” Activists ask me questions like this all the time. Now you can find out if you are a terrorist using this convenient flow chart! When are Militias and Tea Party Members “Terrorists”? The terrorism rhetoric of corporations is absurd and can be funny at times, but it has dangerous consequences if we allow it to go unchecked. For example, there are secretive political prisons on U.S. soil for “domestic terrorists.” Daniel McGowan, an environmental activist, is housed there. Please follow this link and submit a comment against the government’s proposal to make them permanent.